La Junta and Rocky Ford are in Otero county. Anthem BCBS has 19 unique providers in Otero County. Anthem BCBS has 0 unique facilities in Otero County. Anthem BCBS has 19 total unique providers + facilities in Otero County. Bright has 6 unique providers in Otero County. Bright has 2 unique facilities in Otero County. Bright has 8 total unique providers + facilities in Otero County. Cigna has 0 unique providers in Otero County. Cigna has 4 unique facilities in Otero County. Cigna has 4 total unique providers + facilities in Otero County. Colorado Choice has 58 unique providers in Otero County. Colorado Choice has 4 unique facilities in Otero County. Colorado Choice has 62 total unique providers + facilities in Otero County. 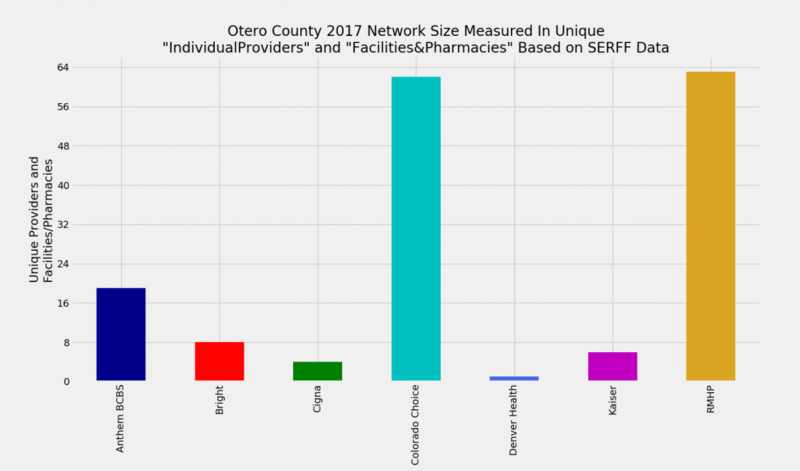 Denver Health has 0 unique providers in Otero County. Denver Health has 1 unique facilities in Otero County. Denver Health has 1 total unique providers + facilities in Otero County. Kaiser has 5 unique providers in Otero County. Kaiser has 1 unique facilities in Otero County. Kaiser has 6 total unique providers + facilities in Otero County. RMHP has 50 unique providers in Otero County. RMHP has 13 unique facilities in Otero County. RMHP has 63 total unique providers + facilities in Otero County.